Sherpas. The only badasses that can take you safely to the snowy mountaintops. Getting to see the sights and explore Kyrat is hard without knowing how to get around. So here is the rundown on ways to travel around this magnificent country. Kyrat lacks a metro, trains, and even cabs (unless you count jumping on the back of a pickup truck with strangers a cab). It will be up to you to find a suitable mode of transportation. Cars are always unlocked for some reason, and no one seems to mind you taking one for a ride, so find the nearest car and press the pedal to the metal. There are roadblocks and checkpoints here and there, but just drive around (or through). As a tourist, all you’ll get is a great gunfire salute. Hot tip: How to fix your car. If you need to get somewhere and wanna get high at the same time, get into one of these. A snowmobile is a great machine if you venture into a snow covered area. Or just wake up there for some reason. Need to cover some distance in a jiffy? It’s a small chopper (not like in motorcycle, but a helicopter). It’s not exactly an Apache attack helicopter, but it’ll do. Soaring through the air in a home-welded, duct-taped metal rod with rotors really makes you feel alive. 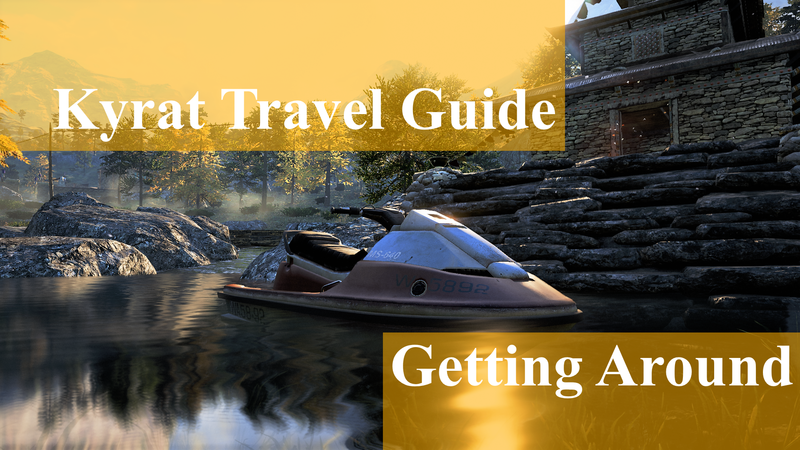 If you prefer a relaxing sailing down the many rivers of Kyrat, find (take) a boat. People here seriously don’t take any measures to prevent their vehicles from getting “borrowed”. Chase elephants. Play with newfound friends. The possibilities are numerous with a boat. Hitchhiking may take you to places unknown. Some find it frightening, others exciting. Getting on the back of a car steered by rebels is a surefire way to kickstart your journey. Watch out for freeloaders jumping onto your car, flipping the bird. The transportation methods in this backwards (or progressive?) country is free (seemingly), but other stuff is not. Next up: Currency. Crucial for acquiring resources for further travels.